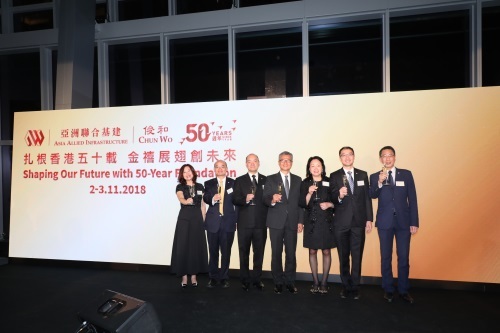 HONG KONG, Nov 5, 2018 - (ACN Newswire) - Asia Allied Infrastructure Holdings Limited ("AAI" or "Group", stock code: 00711) and its wholly-owned subsidiary Chun Wo Development Holdings Limited ("Chun Wo") hosted a 50th Anniversary Celebration Cocktail at sky100 last Friday to commemorate their fruitful results and accomplishments in developing business over the years. Guests joining the grand celebration included industry leaders and political and business luminaries from Hong Kong, Macau and Mainland China. Mr. Chan Mo Po, Paul, GBM, GBS, MH, JP, Financial Secretary of HKSAR Government, and representing AAI, Chairman Mr. Dominic Pang, CEO and COO Ir Dr. Derrick Pang, JP, and senior management together officiated the toasting ceremony at the Cocktail. Mr. Chan Mo Po, Paul, GBM, GBS, MH, JP, Financial Secretary of HKSAR Government, said, "Congratulations on the 50th anniversary of Asia Allied Infrastructure and Chun Wo. Over the past 50 years, the Group has been playing an important role in the development of the infrastructure in Hong Kong. Thanks to the Group for its continuous commitment to building Hong Kong and bringing numerous landmark buildings. I wish the group an endeavors future and continue to walk with Hong Kong." Mr. Dominic Pang, Chairman of AAI, said, "In the five decades since it was founded, AAI has developed from a local construction company into an enterprise with a diverse business portfolio and a business footprint spanning across Asia. As we celebrate making the 50th-anniversary milestone, we want to thank the community, our business partners, shareholders and you our friends here today for giving us support and trust, and our staff for their unwavering exertion all these years. In the future, the Group will continue to expand market coverage and push to gain yet more extensive business experience, so that it may seize new opportunities in the Greater Bay Area, develop into a leading multinational company and make more milestone achievements." An important complement to its 50th anniversary, the Group also announced the winners of the "Chun Wo Innovation Student Awards" (the "Awards"). Team Twind Turbine from the City University of Hong Kong snatched the Gold Award and Merit honor in "The Best Engineering Solution Award" and "The Most Innovative Award". Team MedEasy from the Hong Kong University of Science and Technology ("HKUST") won the Silver Award and "Merit - The Best Social Impact Award", and the Bronze Award went to Piezoelectric Smart Road, also from HKUST. The Awards aims to encourage young people to come up with innovative engineering solutions that can help developing countries tackle sustainable development issues. 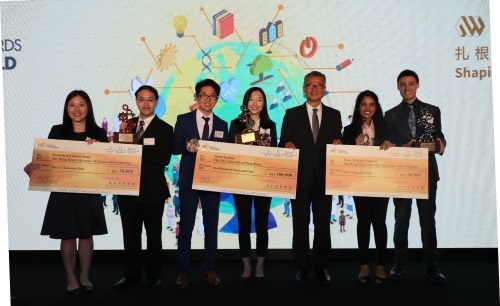 Mr. Chan Mo Po, Paul, GBM, GBS, MH, JP, Financial Secretary of HKSAR Government, who presented the awards to the winners, encouraged students to make use of innovative thinking and creativity to come up with innovative engineering solutions to make the world a better place. Winner of the Gold Award received a cash prize of HK$100,000. That plus the cash prizes for winners of the Silver and Bronze and Merit honors totaled up to HK$200,000. Chun Wo will also provide the Gold Award winning team resources and technical assistance for a year to help it turn its idea into reality. Ir Dr. Derrick Pang, JP, Chief Executive Officer and Chief Operating Officer of AAI, said, "The Group has advanced shoulder-to-shoulder with Hong Kong in the past five decades. We are very proud to have participated in infrastructure projects and seen Hong Kong transforming from an industrial city in the 1970s into an international metropolis today. The Group, while developing business, is also devoted to fulfilling its corporate social responsibility, as it firmly believes nurturing more talent is vital for the long-term development of a society. Hence, we hope to through the 'Chun Wo Student Innovation Awards' spur innovative ideas in young minds that they may come up with solutions that can bring cities closer together and help promote sustainable urban development." Mr. Chan Mo Po, Paul, GBM, GBS, MH, JP, Financial Secretary of HKSAR Government, presents awards to winners of the first Chun Wo Student Innovation Awards, including team Twind Turbine from the City University of Hong Kong, which won the Gold Award and "Merit - The Best Engineering Solution Award" and "Merit - The Most Innovative Award"; Team MedEasy from the Hong Kong University of Science and Technology won the Silver Award and "Merit - The Best Social Impact Award", and the Bronze Award went to Piezoelectric Smart Road, also from HKUST. Asia Allied Infrastructure Holdings Limited ("Asia Allied Infrastructure") is listed on the Main Board of the Hong Kong Stock Exchange under stock code 00711. It is engaged in various businesses including construction engineering and management, property development and assets leasing, security services and property management. With Hong Kong as its business development base, Asia Allied Infrastructure is also exploring development opportunities with Asia as the main focus, as well as in overseas markets. Its subsidiary "Chun Wo" is a renowned construction contractor and property developer in Hong Kong, which enables Asia Allied Infrastructure to capitalise on that company's solid construction experience and professional capabilities to seize the opportunities for infrastructure development in countries along the area of the "Greater Bay Area", and, ultimately, to increase overall profitability and create higher investment value. Chun Wo Development Holdings Limited ("Chun Wo") was founded in 1968 and is a key subsidiary of Asia Allied Infrastructure Holdings Limited (stock code: 00711.HK). The Company is principally engaged in the core construction and property development businesses with the professional capability to undertake large integrated construction projects. Recent examples of large infrastructure projects in Hong Kong within which the Company has undertaken works include the Central-Wan Chai Bypass, Liantang/Heung Yuen Wai Boundary Infrastructure, the Hong Kong-Zhuhai-Macao Bridge Passenger Clearance Building, the Guangzhou-Shenzhen-Hong Kong Express Rail Link (Hong Kong Section) and the MTR Shatin to Central Link. With deep roots in Hong Kong for nearly 50 years, Chun Wo has accumulated extensive experience and a strong position in the construction sector enabling it to expand business to countries along the Southeast Asia. Examples of such expansion are the acquisition of a construction and engineering consultancy in Singapore and the aqueduct design and construction projects undertaken in the Philippines during recent years.